If you were born in the early 1900s, I believe your answer to the question “Could the Titanic sink?” would be a big NO! Man believed the Titanic couldn’t sink. In fact, they believed that even God couldn’t sink that ship. They were amazed at what they saw, and heard on the 14th day of April, 1912. 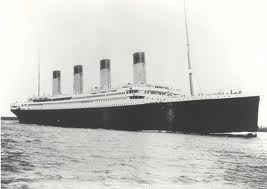 The great Titanic did sink, and majority of the people on board perished. May their souls rest in peace. In the days of Noah, people didn’t believe until the water came down. They forgot that the World had a Creator, and He represent Justice. I don’t know why human beings prefer to wait when they have enough time to flee from danger. I can’t understand why we shun the truth. Jesus said Heaven and Earth shall pass away. “When the Son of Man returns, it will be like it was in Noah’s day. In those days before the flood, the people were enjoying banquets and parties and weddings right up to the time Noah entered his boat. People didn’t realize what was going to happen until the flood came and swept them all away. That is the way it will be when the Son of Man comes. (Matthew 24:37-39 NLT). I saw on the news how people ran when Japan was hit by earthquake, and tsumani. People left their homes, cars, businesses, etc. the most important thing for them that time was their lives. That is they were afraid to die. What are you waiting for today? Ain’t you going run to safety? There is going come a day when this world, and everything we see will be consumed by fire. Where would your soul be? Jesus asked this question; what shall it profit a man if he gains the whole world and lose his own soul? This world has nothing good to offer. Come to Jesus today. Be reminded today that the earth is reserved for fire. Accept the truth; Heaven and Earth shall pass away. Stand for Jesus, Live for Jesus. Flee from the wrath to come. Today is the day you have, tomorrow may be too late. I don’t mean to scare you but you could die today. How prepared are you?